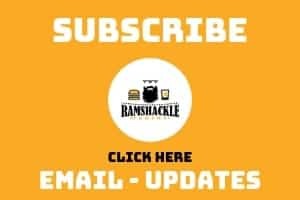 September 13, 2018 (Last Updated: April 9, 2019) - As an Amazon Associate I earn from qualifying purchases. 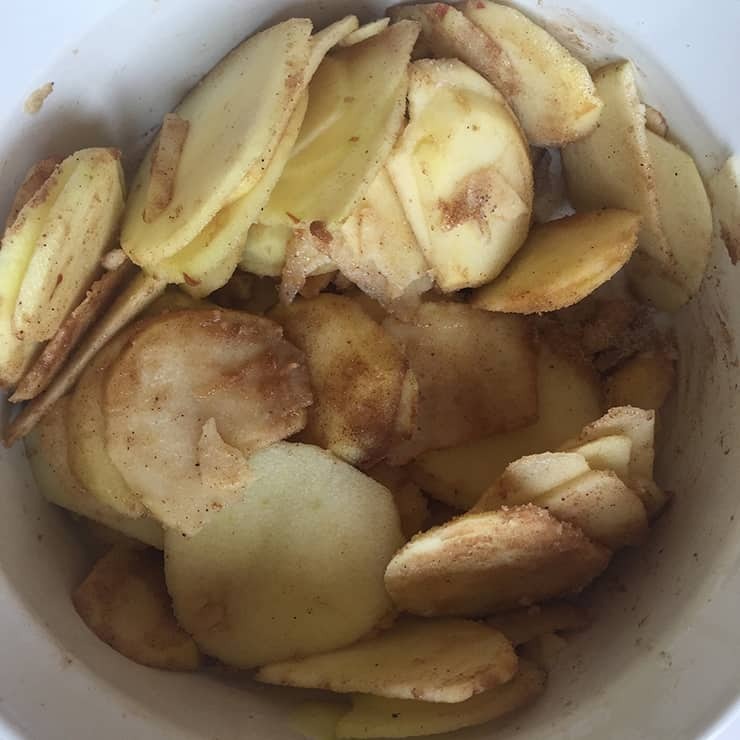 A fun and simple dessert recipe that is a bit easier than a traditional Apple pie. 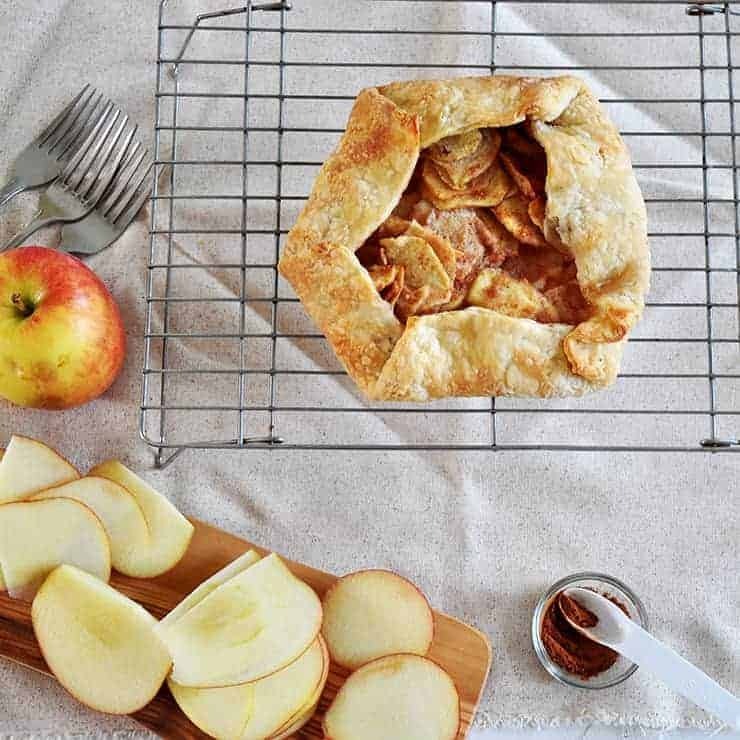 Get the hookup with this Rustic Apple Crostata Recipe. We are in the midst of our apple pie series and today we are going to make a Rustic Apple Pie Crostata. 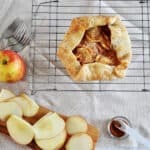 This is a splendid little variation of the traditional apple pie that does not use a pie tin, but still gives all the beautiful flavors that an apple pie crust can provide. 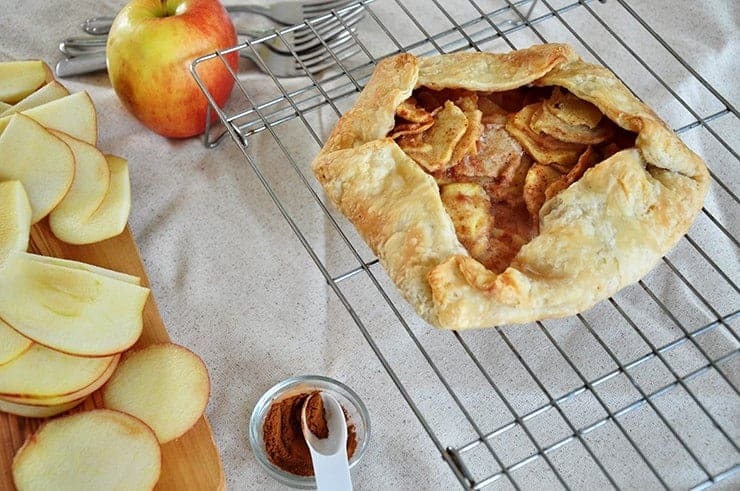 Get your pie exploration pants on and give this Rustic Apple Crostata recipe a shot! Crostata is a free-form Italian pie. Essentially, it is a rustic pie that is not contained within a baking tin and generally cooked on a sheet. Like many other pies, it really can be sweet or savory. This apple crostata recipe obviously is meant to tantalize your sweet tooth and not your savory tooth. Is a savory tooth a thing? Hmm. I defer to my friends over at MyRecipes on this matter. A Crostata and Galette are really the same things. They are a free-form pastry that can be filled with sweet or savory fillings. For our Crostata recipe, we will be using apples as the filling. Now, a tart is something that is a bit different. 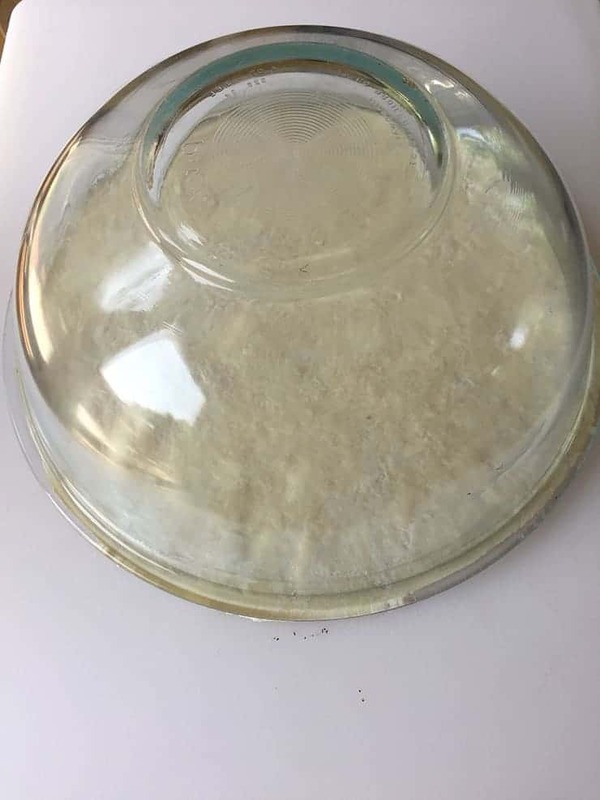 While essentially the same, it is defined by the pan that is used. While Crostatas and Galettes are baked on open sheets, the tart is baked in, surprisingly enough, a tart pan. We are deferring back to our traditional apple pie recipe for the crust. This butter pie crust has so many uses and is very flaky and tasty. Why ruin a good thing? I advise you check out our traditional apple pie recipe to read up on our crust, but we will be including it in this recipe, as well. The only real difference is that it will be halved and we cut/form it slightly differently than our traditional apple pie. 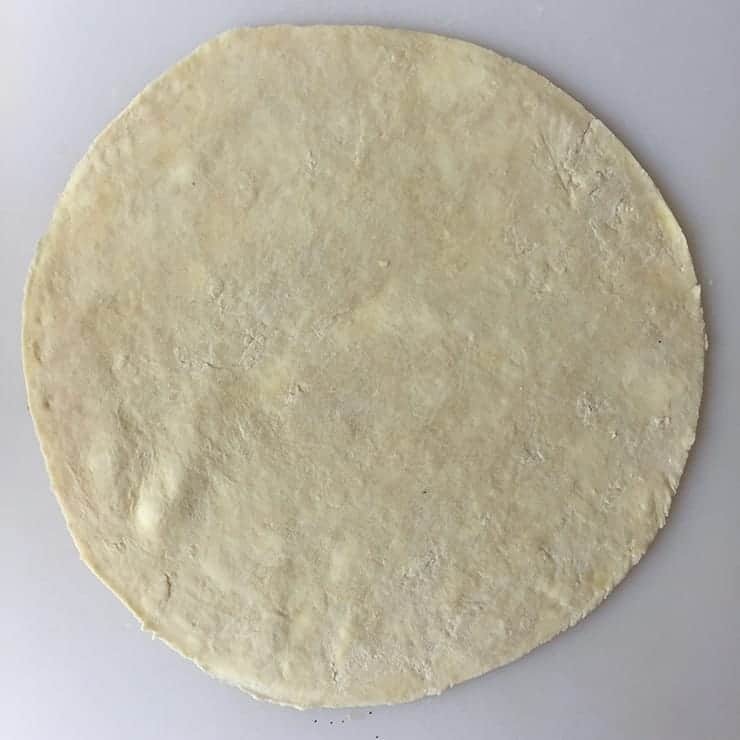 I used a large glass bowl to cut the edge by placing it face down on the dough and using a knife to cut out my circle. I suppose you could really use all the dough, but there is some value in using a uniform disk as a crust. Things will bake a bit more evenly and the end product will look a bit more refined. A crostata is rustic, but uniformity can be handy when it comes to baking. One mistake I found that is fairly easy to make in this Apple Crostata recipe is to try and use too much fruit. 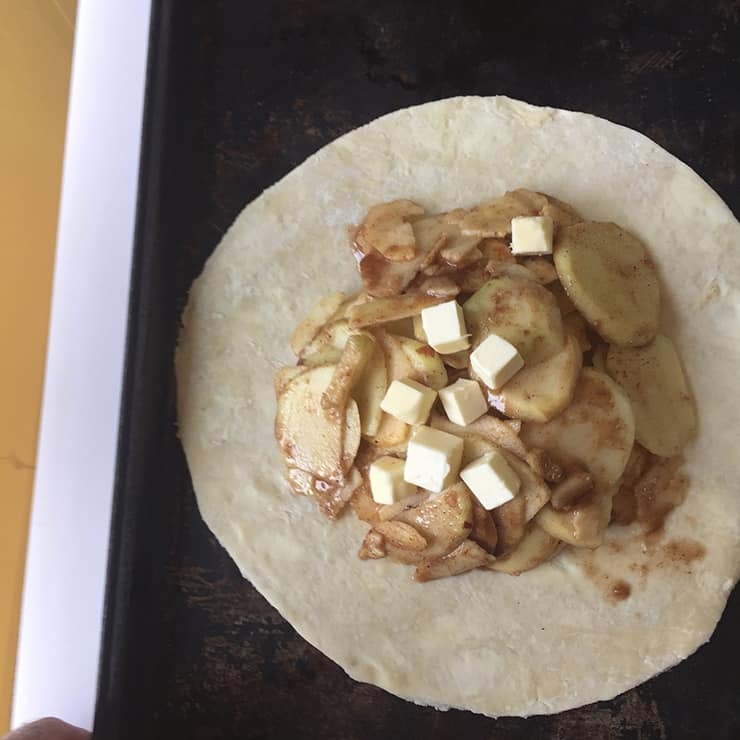 I used two large Braeburn apples in my recipe. We want to be able to fold our edges over the filling and make it look nice. It can be tempting to pile on the apple mixture but don’t. Yes, the filling is awesome, but a balanced crostata recipe is a beautiful crostata. Before we fold the edges over and place this bad boy into the oven, let’s make sure to add some butter on the top. Sure, it adds calories. You know what else it adds? Flavor. Also, it helps the apple filling look just a tad more beautiful since it is so exposed. It does not have the luxury of hiding behind a crust like a traditional apple pie, so we want that middle part to look as appealing as it tastes. This Rustic Apple Crostata recipe is as delicious as you can imagine. Give this apple pie cousin a try to impress your friends and relatives at your next gathering. It is a perfect addition to a traditional spread or even a way to make another pie when you run out of pie tins! If you try this, leave a comment below. Also, make sure to sign up to get updates via email and also follow me on Instagram! This Apple Crostata is as impressive as pie, but only half the work. 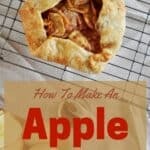 This is such a delicious apple recipe that celebrates Italian desserts, apple desserts, and pies. We use a great homemade butter pie crust and fill it with real apples. Serve me up a slice! A la mode, please! Looks delicious! I’m going to make this for Thanksgiving and I know it will be a hit. It will be nice to have something a little different while still having the same apple and butter crust taste. Wow, this looks amazing! Such a beautiful looking crostata, almost seems a shame to eat it! I love a good crostata. A little rustic, a little messy, but always delicious! I definitely think my kids will approve of this. They love apple pie as it is and this would be great for our thanksgiving party.